Energy is back in a bear market now led by oil’s slide mainly due to rising output from Libya and Nigeria, two OPEC members exempt from cutting supply. The S&P GSCI Energy Total Return is on pace for its worst quarter since the fourth quarter of 2015 losing -13.4% quarter-to-date (through June 19, 2017.) This is driven by the Brent crude and (WTI) crude oil in the index that are also having their worst total returns since Q4 2015, losing 13.7% and 13.9%, respectively. 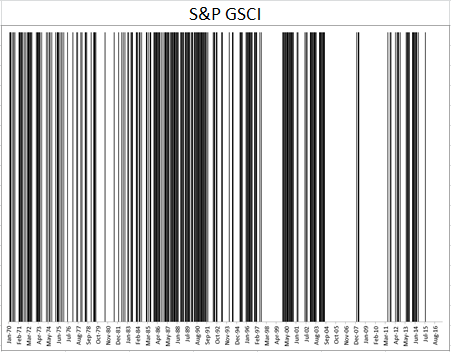 In turn the S&P GSCI Total Return is also suffering with a loss of -8.3% in the quarter thus far, on pace to be its worst quarter since Q4 2015. However, ex-energy, commodities are doing fine. Source: S&P Dow Jones Indices. Data ending June 19, 2017. 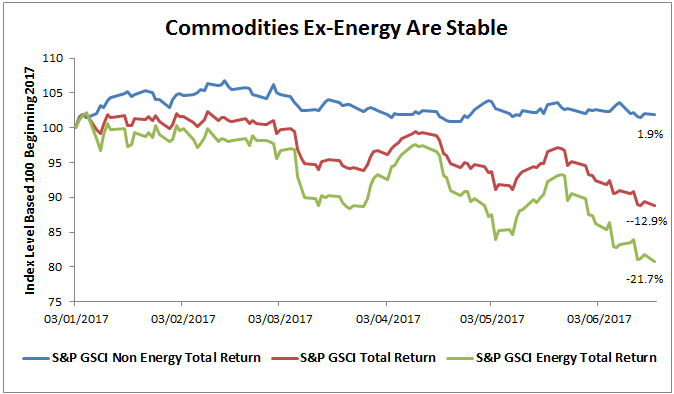 Though energy’s impact on the broad commodity index is weighing the S&P GSCI Total Return down 12.9% year-to-date, investors are highly interested as commodities have rebounded more than 13% off their bottom on Jan. 20, 2016. Also, ex-energy commodities are up slightly this year with some like wheat (+8.6%,) cattle(+15%,) aluminum (+10.3%) and gold (+7.7%) up substantially. Now many investors fear political risk, weakness in the financial sector and uncertainty about global economic growth, so turn to gold as a safe haven. 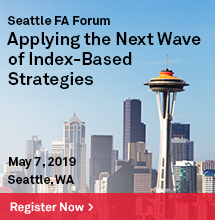 Others seem to like trading around the volatility in oil despite the drop, and the rest of the demand is mainly from the chance to enter the asset class at attractive levels for the longer-term benefits of inflation protection and diversification. With the renewed interest in commodities as an asset class has also come more concern about contango, a term-structure condition where futures contracts with nearby expiration dates are cheaper than contracts with later-dated expiration dates. The result of contango is a roll return loss from selling the cheaper, expiring contracts to buy more expensive later-dated ones. 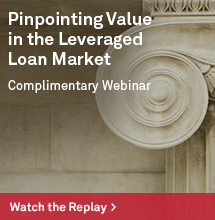 (There is also an opposite condition called backwardation that is profitable to investors.) Contango happens when there are high storage costs from excess inventories, which has been the case as commodities have been substantially oversupplied. Since commodities have been in contango since Aug. 2015 as measured by the roll yield (excess return – spot return of the S&P GSCI,) many investor think commodities are always in contango. However, this is certainly not the case, so below are some charts to demonstrate exactly how much time commodities spend in each condition of backwardation and contango. The black lines represent months in backwardation and the white lines represent months in contango. 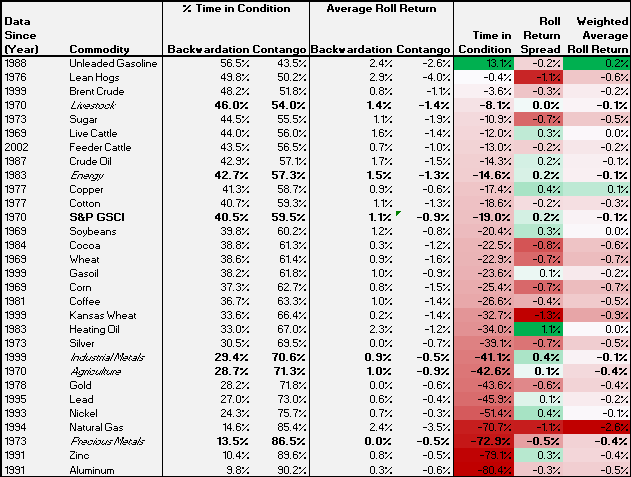 Overall, the commodities have spent about 60% of months in contango and 40% in backwardation. On average the roll return gain from backwardation is 1.1% in a month and the roll loss from contango is -0.9% from contango in a month, yielding a weighted average of about -0.1% in a month over time. Unleaded gasoline spends 57% of months in backwardation, the most time of all the commodities. On the other hand, aluminum spends just 10% of its months in backwardation, the least of all the commodities. On average in a month, the roll return gain from unleaded gasoline is 20 basis points and the loss from aluminum is about 50 basis points. Note the difference in the pattern of the two term structure charts. 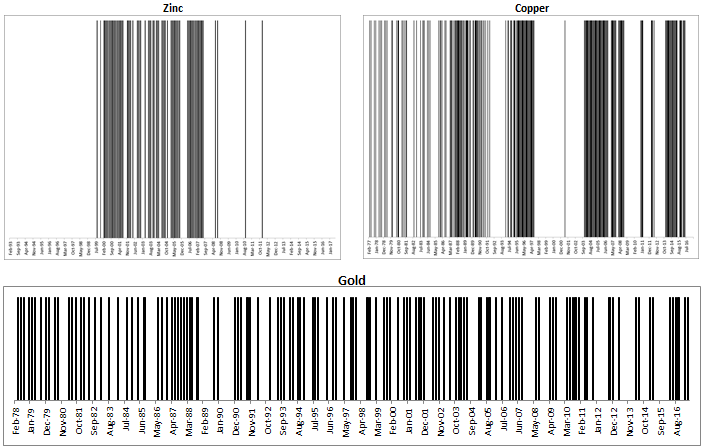 Most metals (except copper) are oversupplied like aluminum but the pattern of inventory is different. For example gold is almost always in contango, about 80% of months, loses only about 40 basis points on average since it is relatively cheap and easy to store. Zinc is almost 90% in contango and loses about the same on average as gold, but again, notice the inventory pattern is quite different with the big block of backwardation shown in black from a shortage. On the other hand, copper is much less oversupplied and is difficult to store so has a more persistent term structure commanding higher premiums, gaining 0.9% on average in backwardated months versus losses of 0.6% during months in contango to average a total monthly gain of 0.1%. For perishable commodities in agriculture like sugar and corn, notice how frequently their term structures change as suppliers try to adjust though weather can interfere with decisions. The inventories are also relatively difficult to store so, the weighted loss on average is -0.7% for corn and -0.5% for sugar. Lastly, the most popular commodities, Brent crude and (WTI) Crude oil that are so oversupplied right now, are not always in contango, although they have been in the condition since July (for Brent) and Dec. (for WTI) 2014. For Brent, the 35 months is a new record, following its longest prior streak of 32 months ending in Dec. 2010. However, (WTI) Crude oil now in its 30th consecutive month in contango has had one longer bout of contango that lasted 36 months ending Oct. 2011. 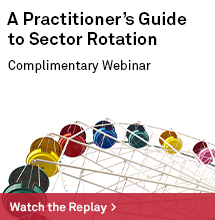 While they are concurrently in contango, they are not always moving together and the premiums from WTI are greater. On average WTI gains 1.7% in a month in contango while losing 1.5% during a backwardated month, though Brent loses 1.1% versus a gain of just 0.9%. 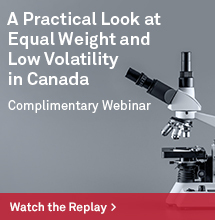 These differences drive one of the most popular spread trades and continue to present opportunities that the market has been interested in to trade the volatility. Please click on the link here to read about how long the oil contango might last, and to see more detail about the history of backwardation and contango per commodity, please reference the table below.